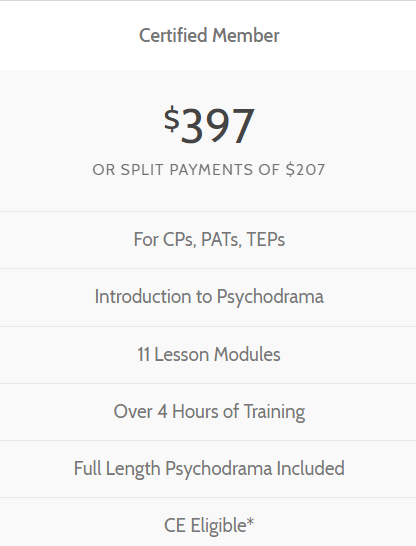 *6 CEs provided by Ce-Classes.com* Program does not award Psychodrama certification training. 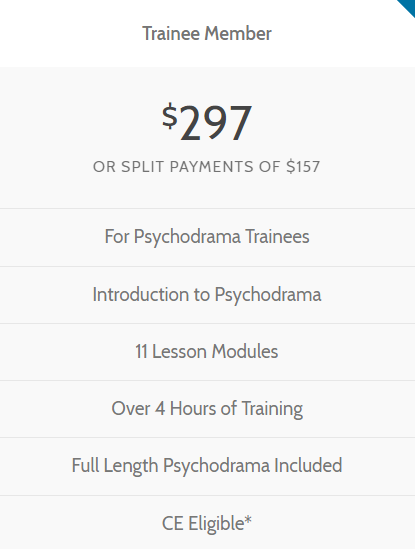 For more information on certification requirements, please visit PsychodramaCertification.org - or to find a certified Psychodramatist or Trainer, please visit ASGPP.org. Includes a brief history of Psychodrama's founder J.L. Moreno, MD and his early work, an overview of the method's applications and the overarching principles contributing to its effectiveness. Module Two: What is Trauma? Creating a working definition of trauma, the various ways it is re-experienced for the individual, its effect of "rhythmic rupture," and various contributing causes and their overwhelming prevalence. Module Three: What Are the Trauma Disorders? An overview of the trauma disorders occurring across a broad diagnostic spectrum, including: Post-traumatic Stress Disorder, Depersonalization Disorder, and Generalized Anxiety Disorder. How trauma reorients and effects the brain, neurological changes as a result, including the impairment of communication between the brain's hemispheres, and functional implications of overwhelming trauma. Highlighting the imperative of the therapeutic relationship for healing, the essential nature of safety and consistency, and the role of expressive therapies, including their ability to connect the internal verbal condition with the non-verbal. Reviewing the ability of Psychodrama to bring objectivity and accurate labeling while re-writing trauma-based material, moving the brain beyond what is "stuck," and creativity as the key to change. Introducing a myriad of Psychodramatic and related action, art, movement and music methods and adaptations, including the Therapeutic Spiral Model. Delineating the inherent differences between Psychodrama and other forms of therapeutic interventions, in particular how it is separate in nature from Psychotherapy and theater. Underlining the symbiotic nature of the therapeutic relationship and the healing process, establishing it as the core of reconstructive work and experiential validation. An overview of the essential elements, roles, rules and guidelines, and prevailing structures and methods of a Psychodrama according to the Therapeutic Spiral Model. Summary statements on the importance of safeguards using theater methods, expected outcome factors, testimonials from patients, and where to find out more about Psychodrama. 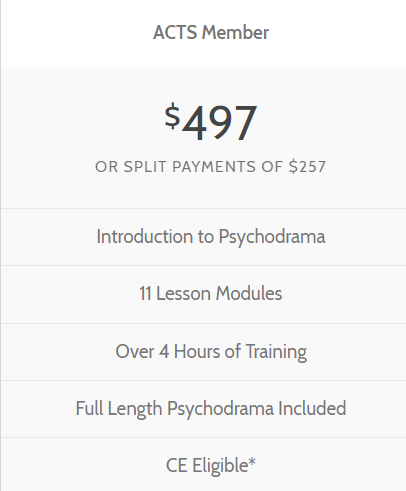 Lifetime access to the Introduction training, an easily accessible introduction that offers an innovative window into the world of Psychodrama. Access your training anywhere you have an internet connection 24/7. Or download and enjoy the module mp3s for on-the-go listening. 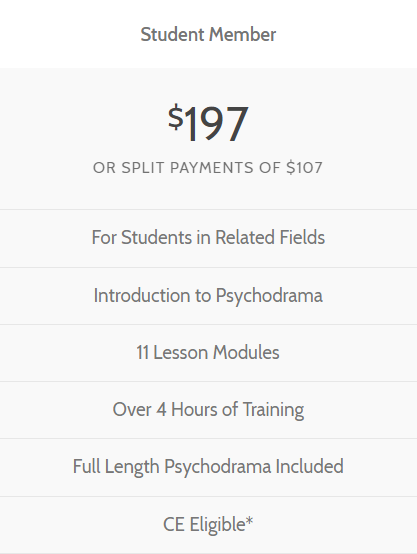 See examples from a psychodrama recorded live throughout the modules and get access to the full length drama. We have a membership that's just right for you.